what, me blog? : Make it Monday: Fun Foam! Heather Nichols has issued the new Make It Monday challenge for the week - incorporate fun foam into your stamping project! 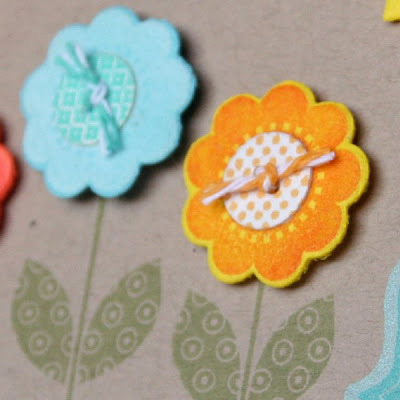 I loved the example she showed of stamping with the fun foam - a custom stamp from any die that you own. I have actually done this before - a very long time ago - so I'm glad that this challenge reminded me of the fun technique! I started by die-cutting the Fillable Frame #4 from foam and stamping it. I added the frame from the new FF Additions set in darker shade of aqua, and a sentiment from the additions set in black. I love that I can get the look of the FF die cut and the frame stamp, all in a single-layer! Next I used the die and stamps from the new Flower Fusion #1 set to cut the flowers in different colors, and then stamp them in tone-on-tone designs. Then I cut the smallest button from the Buttoned Up #1 collection and stamped with Bitty Background Blocks. After attaching the buttons to the flowers with coordinating twine, I attached the flowers to the card with dimensional foam adhesive. The flower stems are also from the Flower Fusion set, and that strip of grass is the little grassy bit from Love Lives Here, stamped repeatedly against a Post-It mask to keep the bottom edge straight! Finally, I added a "sun" cut from foam with a Limitless Layer die, stamped it with the circle image from Tag-its #1, and then masked off a circle in the center and added some dots from Polka Dot Basics 2. I think it came out cute! Debbie, this is so cute! I love all of the fun foam you used. This is SO great! I absolutely LOVE the way you used the fillable frame! That is so clever! It really looks great using the two shades of aqua. This technique is definitely one that I may just have to try! The entire card is fabulous! Wow! I love it and I learned a lot from your techniques. Thanks for sharing. Your flowers are super sweet, and thanks for the tip on getting a perfectly straight line (although I'm not sure I could get mind straight even WITH a post-it) LOVE the sun!!! Oh, this is perfect! I love love love it! This is such a delightful card Debbie. I adore the bright and cheery colors and your use of the foam...well, dare I say it's fun. ;) So pretty! So cute, Debbie! I love the line of flowers! This is bright and cheery, but the sun steals the show. Stamping it with Tag it was genius! Great job on MIM.